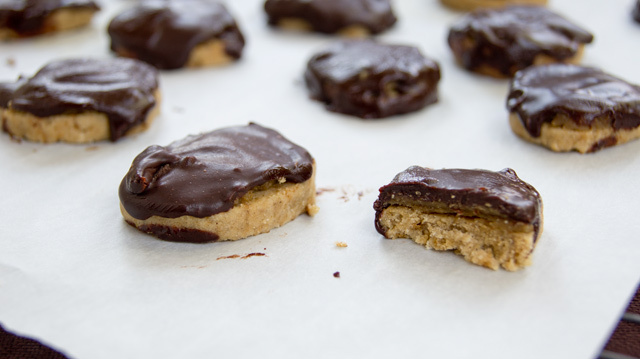 Cucina Libera: Vegan, Nut Free Girl Scout Cookies & So Delicious Giveaway! 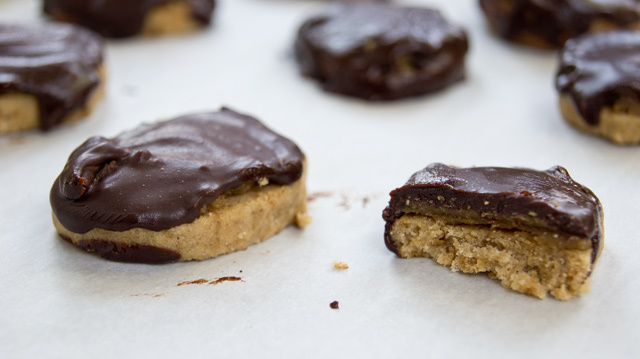 Vegan, Nut Free Girl Scout Cookies & So Delicious Giveaway! It's around (maybe a bit after) the Girl Scout Cookie time of year. I honestly can't remember the last time I had a Girl Scout cookie. Although, there was a moment, back in the day, when a couple of them were actually vegan - Tag-a-longs, being the one of the varieties I remember and remember enjoying,1 ...pre and (briefly) post-vegan. I also figured, I could just make them myself without all of the dairy, gluten, fillers and preservatives... and peanuts. Oh! Of course I could. I already have a lovely basic shortbread recipe. I really would just need to add a couple of extra "garnishes" and assemble. If you're wondering (worried?) about the flavor of the sunflower butter, in these cookies,3 it was bizarrely reminiscent of peanut butter. I don't know if my brain was creating some sort of long-buried flavor connection, but I totally thought of peanuts. My stomach, however, was very happy that there were, in fact, no peanuts at all. My Tag-a-longs ended up being minis; it's sorta funny, because despite my penchant for small treats, I didn't set out to make them that way.4 I guess my baking instinct was on auto-pilot; I seriously didn't even notice until I started to slice the dough log into cookies. They can, of course, be made larger to suit your tastes. The cookies can also be fully immersed in chocolate - like the originals - if you prefer. I found coating only the top resulted in a sweetness that was a bit closer to my liking. It was also less effort to execute. 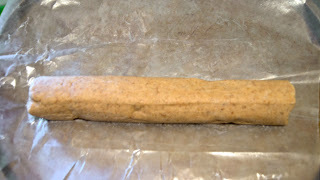 Nut Free (Vegan, Gluten Free...) "Tag-a-longs"
Prepare the chia egg with the desired liquid component, and set aside. Combine all of the ingredients for the Sunflower Butter layer, and mix well to allow the sugar to dissolve and incorporate. Place the mixture in the refrigerator to chill. In a small bowl, cream together the Earth Balance, coconut sugar and vanilla, until the mixture is mixed well, and the sugar begins to dissolve. In a separate bowl, whisk together the sorghum, tapioca, and sea salt, until evenly combined. Add the buttery mixture to the dry ingredients and mix until fully incorporated. Add in the chia egg, and mix until a smooth dough forms. Shape the dough into a cylinder of the desired diameter - mine was about 1.5" for the minis. Gently roll/wrap the log in a piece of parchment or waxed paper, and place it in the freezer for 10-15 minutes. Remove the chilled log and slice into cookies, approximately 1/4" thick. Arrange the cookies onto an ungreased baking sheet, leaving a bit of space between each cookie, and bake for 10-12 minutes. Do not overbake! The cookies should seem slightly undercooked, when removed from the oven. They will continue to bake and firm up as they cool. 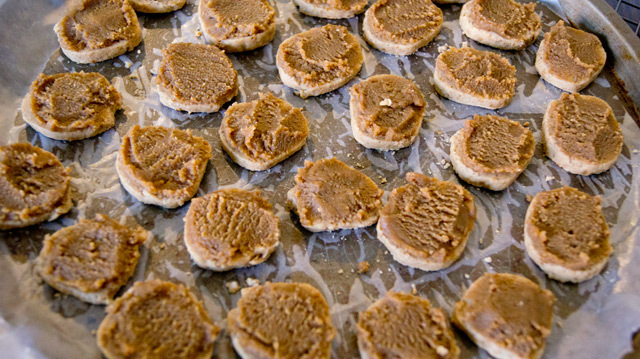 Allow the cookies to cool right on the baking sheet. While the shortbread is cooling, begin to prepare the chocolate - either melting the chips in a double boiler, or preparing the easy chocolate as directed. Once the cookies have cooled, remove them from the baking sheet and arrange them on a sheet of parchment or waxed paper - I set them right back on the same baking sheet, with the parchment under them. Gently spread a nice layer of the sunflower butter mixture over each cookie. Take your time. If you're too heavy-handed (literally), the cookies may break. If the sunflower butter seems too firm to spread, allow it to sit a room temp for a few minutes before using. Once all the cookies are covered, place them in the freezer for 5-10 minutes, before coating them with the heated chocolate. To coat the cookies, simple drizzle a spoonful of melted chocolate (or Easy Chocolate) over each cookie, allowing it to run down the sides. If necessary, you can gently distribute the chocolate with the back of a spoon. Allow the chocolate to cool and solidify, by chilling the cookies in the fridge or freezer, before serving. Any leftover5 cookies can be stored in an airtight container in the fridge - or freezer even - for a few days. Place them on a paper towel or kitchen towel to help wick away any moisture. So... 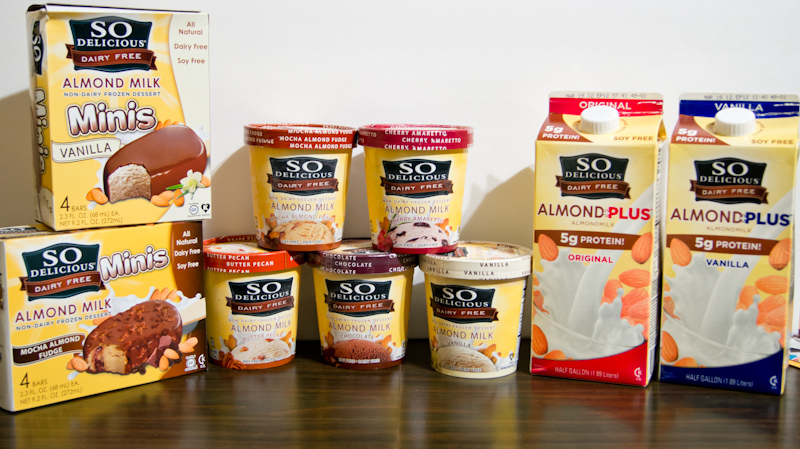 So Delicious has rolled out their newest line of dairy-free products... Almond Plus. They were generous enough to send me some samples, and I was rather impressed. Plus, indeed! I really love the added protein and lower sugars, and they're completely soy-free. I'm still waiting for the Unsweetened Almond Plus milk - I was told that should be rolling out within the next few weeks; however, the Original and Vanilla have about half the sugar of other sweetened almond milks. This is great for someone like the BFF, who prefers sweetened milks, but also wants6 to cut down on sugar. I thought it might take some convincing to try to switch him over - I worried they may not be "sweet enough" for him - but it wasn't difficult at all; he's sold! Let's not forget the Almond Milk Ice Creams! I got to try the Vanilla, Chocolate, Cherry Amaretto, Butter Pecan and Mocha Almond Fudge, as well as the Vanilla and Mocha Almond Fudge bars. The frozen treats combine dehydrated cane sugar with monk fruit, to reduce the sugar content. This was another huge breakthrough for the BFF because he dislikes stevia and other non-glycemic sweeteners (natural or otherwise), but he greedily gobbled the bars and the "ice creams". He is rather partial to the Mocha Almond Fudge. I'm quite fond of the Butter Pecan. YUM! Are you interested yet? Well, here's an opportunity to try them out yourself... for FREE! I want to share the love, so TWO lucky readers will receive a voucher/coupon for a free So Delicious product of their choice. Nut-allergies? No problem! You can try out one of the amazing coconut milk products! Leave a comment below letting me know, "Which Almond Plus product appeals to you most?" 3. Tweet the following message "I'm entered to win @CucinaLibera @So_Delicious product giveaway! http://t.co/pIHwKp5Q"
The giveaway will run until Friday, March 30th midnight, CST. I will announce the winners on Monday, April 2nd. This contest is only open to US readers. 1. "Enjoyed" at the time, when they still used peanut butter and not that poor-imposter-hydrogenated-peanut-spread. 2. Really, isn't the point to support the Girl Scouts? I remember having to try to sell cookies. Even as an eight-year-old, I found it annoying. 3. Or in general... FYI: I like sunflower butter much more than I ever cared for peanut. 5. If they're not all gobbled up... it'll be tough. 6. Tastebuds play a powerful role. I want to try the ice cream! The unsweetened almond milk plus would be awesome for baking and oatmeal too. Yumm the almond milk ice cream sounds amazing! I heard they are also making greek-style yogurt--that's what I would want to try most! Following So Delicious on FB! I'd like to try the Almond minis! Yum! I would love to try the Almond Plus almond milk! 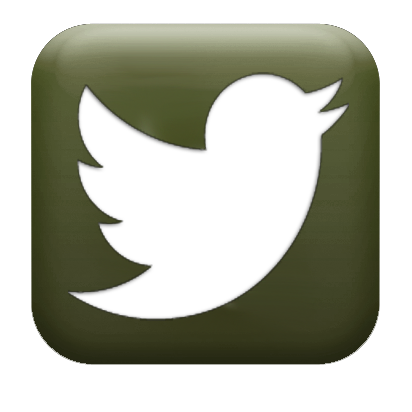 I follow cucina libera on twitter! I follow SoDelicious on twitter! I follow SoDelicious on Pinterest! I think the Almond Plus Butter Pecan ice cream sounds amazing. Before I was vegan, butter pecan was my favorite ice cream flavor, and I have yet to have a vegan version of it. 'Liked' Cucina Libera on Facebook! 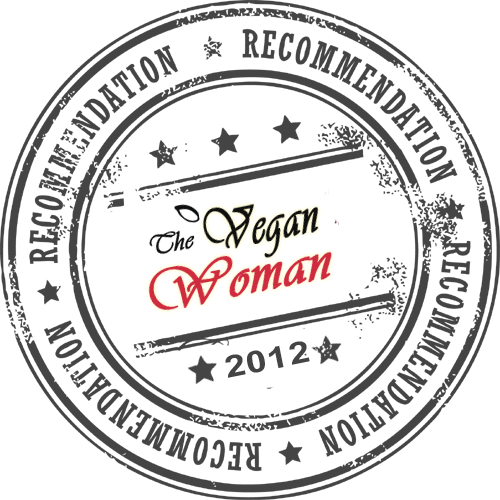 'Liked' So Delicious Dairy Free on Facebook! Following So Delicious on Twitter! Following Cucina Libera on Twitter! The Mocha Almond Fudge Minis look INCREDIBLE. I really shouldn't want something that much, but I do! I connected with So Delicious on FB! I'd love to try the icecream, sounds tasty. I follow your culinary creations board on pinterest! This recipe looks amazing! I am not entering but I did tweet your giveaway! The single serve almond plus milk definitely appeals to me, and I'm hoping my whole foods will be carrying it. I like so delicious on Facebook. I follow so delicious on twitter.